When President Trump calls old friends on one of his iPhones to gossip, gripe or solicit their latest take on how he is doing, American intelligence reports indicate that Chinese spies are often listening — and putting to use invaluable insights into how to best work the president and affect administration policy, current and former American officials said. Of course, the dummy came out and pulled his “fake news!” shtick in light of this shocking story. The New York Times has a new Fake Story that now the Russians and Chinese (glad they finally added China) are listening to all of my calls on cellphones. Except that I rarely use a cellphone, & when I do it's government authorized. I like Hard Lines. Just more made up Fake News! If Russia and China really are surveilling Trump’s mobile calls, one possibility would be that they’re doing it by manipulating an insecure mobile telephony protocol known as SS7. These types of attacks have become an increasing concern around the world; in May, the Department of Homeland Security admitted that hackers may be actively exploiting SS7 against US cellphone users. 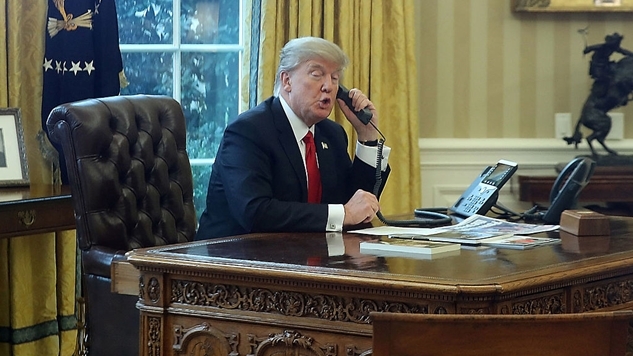 But Karsten Nohl, chief scientist at the German firm Security Research Labs, who researches cell network attacks, says the Times report may indicate that surveillance of Trump’s mobile calls go even further. It “suggests a compromise of the telephone company infrastructure on a deeper level than just sending SS7 requests,” Nohl says. He likens it to an incident when unknown parties compromised switches on the Vodafone Greece network without the carrier’s knowledge, and used that access to tap the mobile calls of Greek government officials and other prominent citizens. A foreign government having comparable access in the United States would be problematic, but unsurprising, given the cat and mouse game of international espionage. Needless to say, making calls on a stock iPhone greatly increases Trump’s vulnerability to that sort of operation. This is what a crumbling empire looks like. By his own admission, our president is financially tied to the Russians, Saudi Arabians and at least several other foreign powers, and he acts in his own interests before the country’s. He contains some of the most valuable information known to mankind in his bowl of Jello that he calls a brain, and he is almost surely giving much of it away to whomever is listening in to his rantings and ravings to his litany of unofficial cabinet members. For example, say we have a spy in the Chinese government, all it takes is one acknowledgement by Trump on these private phone calls and that person is dead. Or if we have a program spying on a certain aspect of the Chinese military, if he brought that up, they would then know how to counter it. There are a relative avalanche of problems that extend from this dynamic, and the fact that Trump is basically acting like a scorned child in the face of violating basic security protocols should only exacerbate these issues. One of the biggest dangers to the safety and security of the United States is the President of the United States.